Sunday March 1st 1896 I was busy most of the forenoon getting ready a nice dinner. I wrote a few lines to Ott. The boys were right here at home all day. I wrote some in the afternoon. Read the papers and a book in the evening. 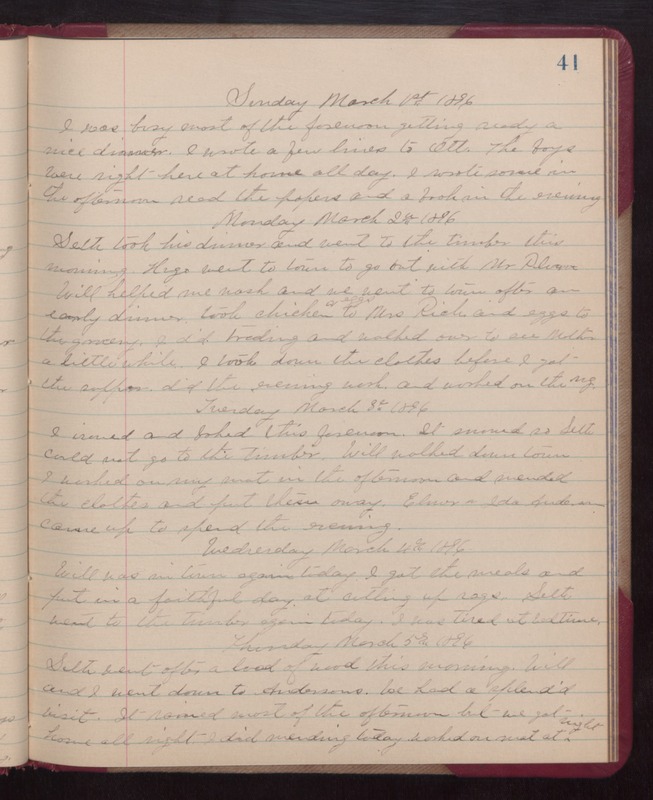 Monday March 2nd 1896 Seth took his dinner and went to the timber this morning. Hugo went to town to go out with Mr [Plum?] Will helped me wash and we went to town after an early dinner. Took chicken & eggs to Mrs Rich and eggs to the grocery. I did trading and walked over to see Mother a little while. I took down the clothes before I got the supper. Did the evening work and worked on the rug. Tuesday March 3rd 1896 I ironed and baked this forenoon. It snowed so Seth could not go to the timber. Will walked down town. I worked on my mat in the afternoon and mended the clothes and put these away. Elmer & Ida Anderson came up to spend the evening. Wednesday March 4th 1896 Will was in town again today. I got the meals and put in a faithful day at cutting up rags. Seth went to the timber again. I was tired at bedtime. Thursday March 5th 1896 Seth went after a load of wood this morning. Will and I went down to Andersons. We had a splendid visit. It rained most of the afternoon but we got home all right. I did mending today. Worked on mat at night.